Are you a YouTuber or Videographer? Or you simply love taking beautiful photos? If you are one of these, we believe you sometimes encounter problems with a light source that makes your photos or footages look incompetent. It is also more difficult to take photos and footages in your room, where the light source is barely able to get in. Worry no more. 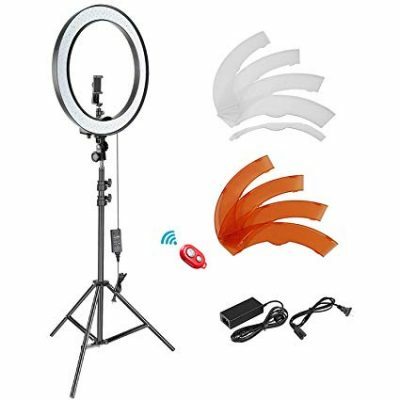 Ring light comes with advanced technology to ease your burden as photographic equipment. 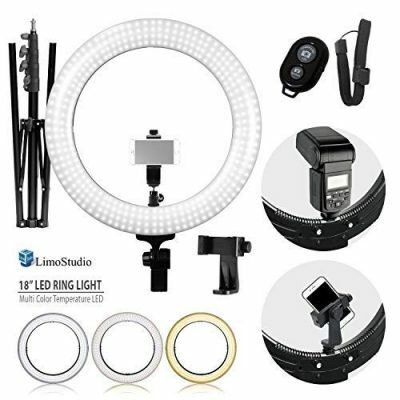 This article will review the top 10 best ring light withstand in 2019, which help you to find the best ring light with stand up to your preferences. Samtian is an ideal choice for video blogging beginners. It provides soft natural light with the advanced technology of adjustable color temperature. It is also constructed with 180 dimmable LED that has a strong capacity to deliver 45W power output. The dimmable ranges from 10- 100 percent, and color temperature ranges ±200K. Its brightness is also incredible and distributed more solid. The reflecting light also gives you a charming eye providing more attractive looks. 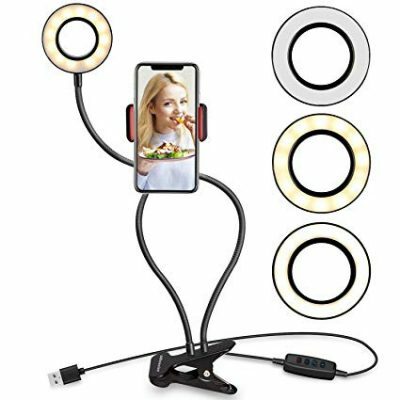 This ring light with stand is also compatible to use with the smartphone. Its stand is also adjustable up to the height of your preferences and needs. Samtian is also lightweight and pretty easy to assemble. LimoStudion is a perfect choice to give you amazing portrait photos. This one has an adjustable head angle, able to use with power supply of 120 V. The ring light also features dimmer control and multi-tone color temperature providing you convenient to choose the color tone accordingly. It also comes with remote control. 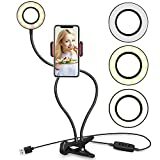 Its cellphone clip holder is compatible to use with any smartphones. The cellphone camera mounting can also be adjusted 360 degrees. 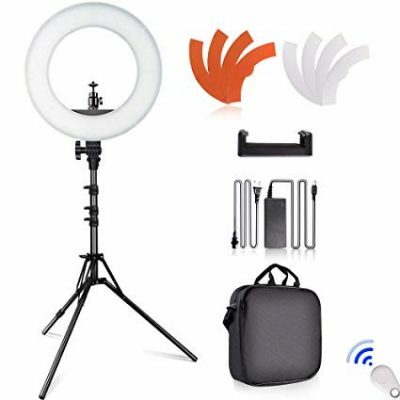 The package includes LED ring light, carry bag, phone clip holder, tripod, as well as Bluetooth shutter. With this one, you will experience a great photo shoot with desired lighting needs. 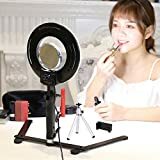 This one is highly recommended to use for video and portrait shooting, Vlog, makeup tutorial, and selfie. It is super lightweight and portable, which gives you conveniences to bring along when you have to go on a trip or working outdoors. ESDDI is built with 4000LM luminous flux which is capable to lesser shadow. Its dimmable range is from 0-100 percent. ESDDI also features adjustable color temperature ranging from 3200k-5600k. The light stand is adjustable with the shortest collapsed height of 48 cm to the maximum height of 190 cm. ESDDI is also built with a great dissipation system and special eye-care design. If you are looking for professional photographic equipment for the live stream, live show, or a selfie, Dahai is made for you. This one is built of 24 cold and warm LED respectively, which gives you easiness to adjust 3 light color mode and 9 different levels of brightness. Dahai is also popular for its versatility, which you can either use as a reading lamp or a selfie light. With Dahai, you have no worry about the difficulty to use. It has 5 switches on its control panel. Its USB supply is also compatible to connect with many devices such as a computer, recharger, and battery bank. And its cellphone holder can support smartphones such as iPhone 7 or 6+, Samsung, LG, Huawei, and more to go. Tremaine is your perfect photographic companion. This one is built with 120 SMD LED providing a great light source and is super incredible for heat dissipation performance. It is compact, takes up little space, and designed with two foldable arms for desktop use. 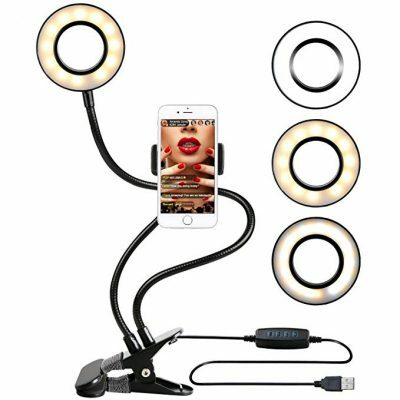 This ring light is adjustable with 180 degrees rotating. It is also durable and long-lasting. Its service life is estimated to be used for more than 100,000 hours. Its dimmable light is from 1-100 percent adjusting to your needs in many instances. Tremaine color temperature is 5500k. With this one, it is also easy to assemble and portable to carry anywhere. This one is a dimmable LED ring light consisting of 120 LED beads. It works great to fill the desired light source for your photographic experiences. Kosheen has a dimming range of 1-100%. Its service life is 50,000 hours. 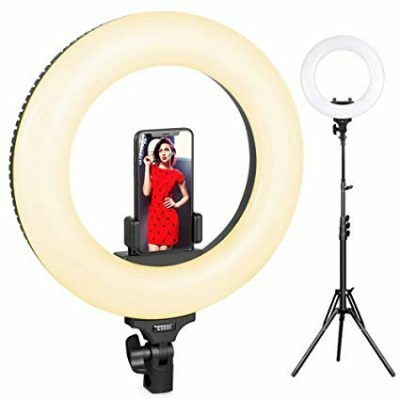 The ring light also comes with a small mirror that benefits makeup artists for doing their tutorials video shooting. Konseen ring light stand is also designed beneficially that allows it to support multiple types of ring light and always keep its balance. This one is a desktop size that you can position on your desktop table and it is super easy to set up. No worry about making the video at night and unable to find enough light sources. UBeesize is your solution. This one is really flexible. You can rotate its bracket clip 360 degrees with strong gooseneck arm bendable in various shape. 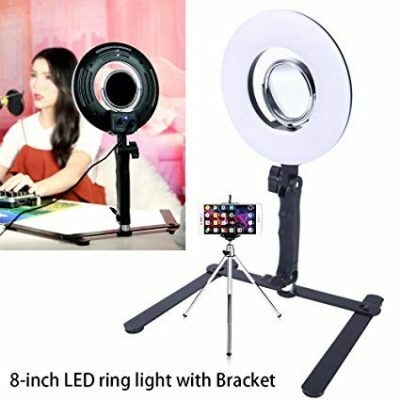 The ring light with stand also has adjustable light color with 3 different colors and 10 levels of brightness for your desired light source. This one is also compatible to use with any kinds of smartphones. The backing clip is also super strong to firmly hold your device. Its USB supply can connect to various devices such as PC, Laptop, and even the battery bank. 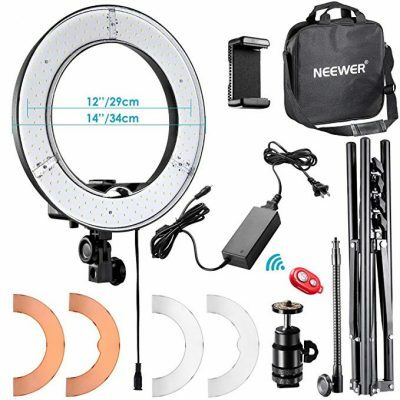 A great photographic light source provided that you can ever find is the brand of Neewer. 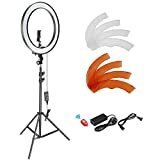 The outside edge of its ring light is measured to be 14 inches and the center is 12 inches. This one is made of dimmable 14 inches LED, which is capable to deliver a dimming range of 1-100 percent. Its foldable stand height is 75 cm, and maximum stand height is 155 cm. 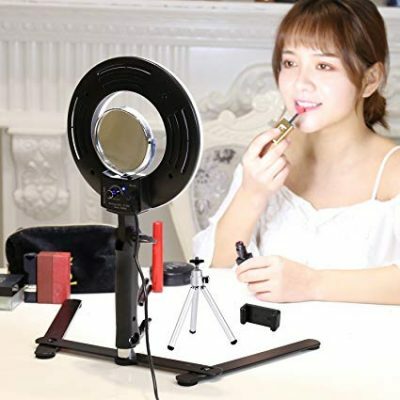 This ring light with stand is also great for health as it has low heat output, consists of an environmental protection system, and it does not radiate UV and infrared light. The product is also lightweight and portable to bring to anywhere. Carrying bag is also included. This one is an 18-inch outer diameter ring light. It is compatible to use with both camera and smartphones, for camera mount is also built-in which makes it convenient for you not to change to another tripod. This neewer is made of 240 pcs LED bulbs. It has a color temperature of 5500k. The ring light also features an orange light color making it look more natural like getting the light from the sun. Its light stand is also made of aluminum alloy which makes it durable and firm. It is also easy to set up and compact giving comfy to bring along anywhere. Carry bag is also provided. 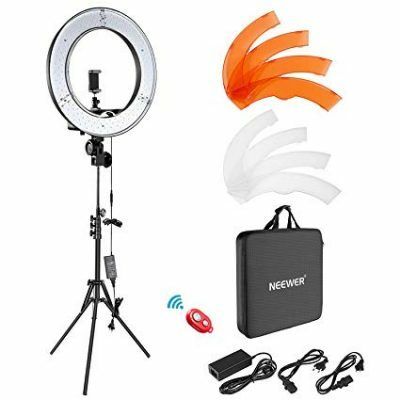 This one can be used with the input voltage of 110 – 240 V.
The last item on our list is another ring light withstand from a neewer brand. 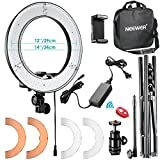 Its dimmable ring light outer edge is 18 inches. Its adjustable height is the shortest of 92 cm and the tallest of 200 cm. The stand is built from aluminum and consists of 3-leg stage design. It also features a great locking system which gives you balance and safe use without any wobble. Its color temperature is 3200k. This Neewer is also able to rotate 360 degree, which allows you to take either portrait or landscape mode. You have come to the end of the article. 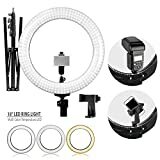 The best ring light with stand helps cameraman or youtube take professional footages and photos. 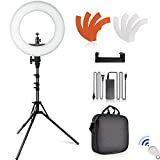 The article has just introduced you the top 10 best ring light withstand in 2019. They are super functional, delivering high performance, affordable, and make you become a professional expert in photography. The ring light with stand is also available online. Hesitate no further. It’s time to experience another great photo- or video- taking moment with brightness and professionalism.